You may be a feeling a bit overwhelmed when when trying to find the best kick scooter for a toddler as there are lots of different brands and options to choose from. There are definitely some important features that you need to make sure a scooter has before you should buy it for a child between the ages of 2-4 years old. An older child’s scooter will be different than the type of kick scooter you should buy for a toddler. You could also consider buying a balance bike for your toddler first. Of course there are other nice features you can look for in a kick scooter, but the above are really important and I wouldn’t recommend a scooter that doesn’t have all of the features above. After doing hours of research on toddler scooters, I’ve come up with the ultimate guide for the best toddler scooter. The Micro Mini Kick Scooter from Micro Kickboard is, in my opinion, the best kick scooter for a toddler. 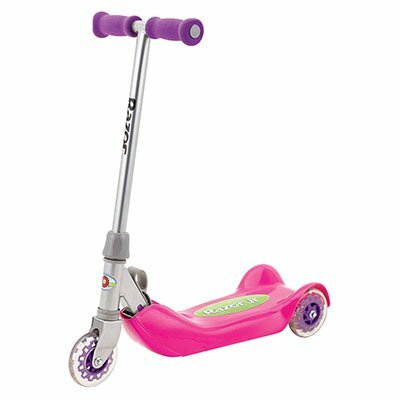 In fact this is the best selling toddler scooter for a very good reason. You’ll notice that the scooter has the 2 wheels in the front. This is for a very good reason as this designs allows for easily maneuvering by a younger child. The award winning design implements a lean to steer concept in which the child simply has to slightly lean to the side to be able to turn the scooter in that direction. You’ll also notice that the deck of the scooter is very low to the ground, which makes it much safer for toddlers to hop on and off. The deck is also wide enough that smaller children will have no problem fitting both of their feet onto the scooter and be able to coast on the pavement. 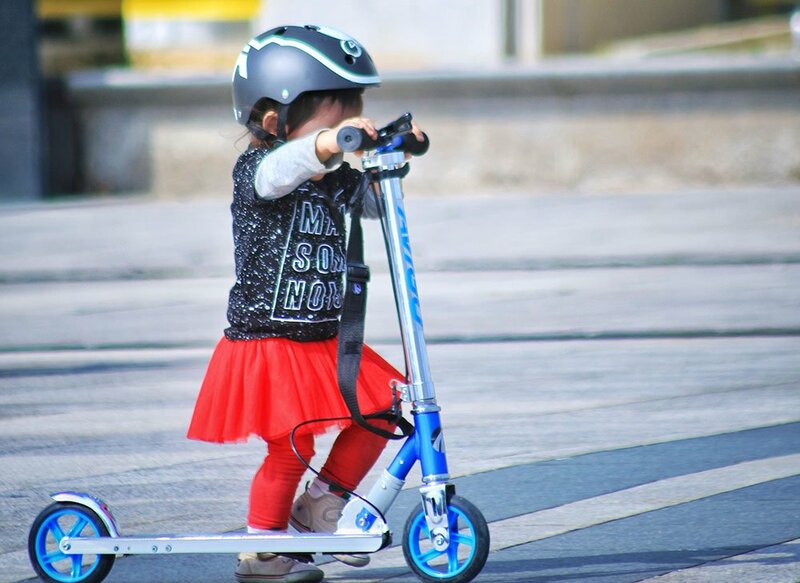 The back wheel brake is very easy for toddlers to use and also helps prepare them for a larger kick scooter when they get older, as most scooters will only have that back brake on the wheel. It’s a very well made piece of equipment that has rave reviews from lots of parents. But, even though it’s sturdy, it’s still lightweight enough for a young kid to lift and maneuver. The easy to learn steering as well and design of the scooter as the durability (because we all know how rough toddlers can be) makes this a must-have product for any young child who wants to learn to ride a scooter or for a child who loves being active outdoors. 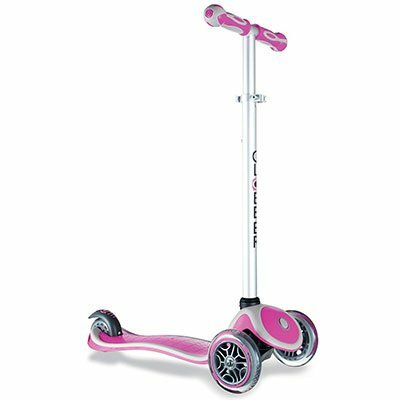 The scooter is recommended for ages 2-5 years old and will support up to 44 pounds. Your child can even pick out their favorite color as it is available in several different options including blue, purple, pink, and green. Another cool thing about the Micro mini scooter is that although it is designed for kids up to age 5 or so, the same manufacturer has a Micro Maxi Kick Scooter that is geared towards ages 5-12 years old. The Maxi kick scooter has basically the same design just in a larger size so kids can get used to the micro mini scooter and then easily transition to the maxi kick scooter with no problem. This is another good option for a 3 wheeled kick scooter for a toddler. With this scooter though, the two wheels are in the back and there is only one wheel in the front. Even with this slightly different design it still gives toddlers the stability they need to easily ride the scooter rather than having to worry about your child tipping off to the side. 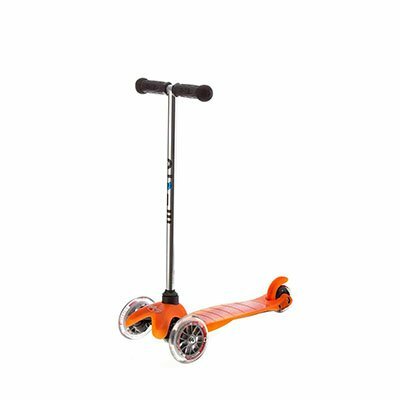 If you are looking for a more inexpensive scooter for a toddler, then you should check out this one from Razor as it does retail for less than the micro kick scooter above. One of the nice features of this product is that it can easily be folded up for storage and is lightweight. It even makes it easier to haul the scooter in your vehicle to the park or even on vacation. Or when your toddler wants to ride the scooter around the neighborhood but ends up quitting during the middle of the walk and you have to carry the scooter back home. Some more nice features of this scooter include the soft foam handlebars as well as the slip-resistant wide deck. One of the cons of this scooter is that there is no rear brake like larger scooters have as well as some of the parents have commented that the wide deck with the two wheels in the back get in the way of their child’s foot while pushing off the ground. Although there are some possible drawbacks this scooter is still highly rated and sells for less than most other toddler scooters. It is recommended for ages 3 years and older although I have read several buyers claim that their two year olds are able to ride with no problem. The weight limit is 45 pounds. 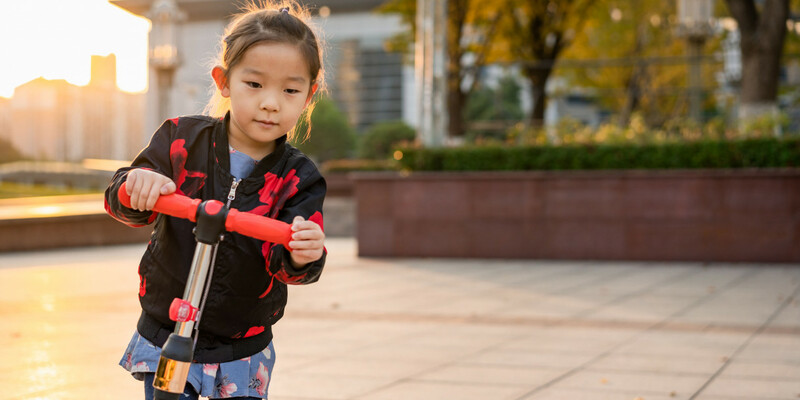 If you have an older toddler or preschooler or you are simply looking for a scooter that your child may be able to use for a longer period of time, then check out the 3 Wheel Scooter from Globber. This scooter is recommended for ages 3 years and up but unlike the other scooters above the weight limit goes all the way up to 110 pounds. So not only is it the best kick scooter for a 3 year old but also for 5 years and up as well. The reason why this scooter has such a wide age range is that it comes with adjustable handlebars that can easily be raised higher as your child gets older. As you will notice this is a three wheel scooter with the two wheels in the front and the rear wheel with the brake in the back of the deck. The three wheels give the stability and balance that a younger child needs but still can be used with older children as well. Another neat feature on this scooter which you won’t find on other ones is the button lock on the front that allows you to lock out the steering. By locking out the steering you can help your child balance better and once they get older you can unlock it so they can start to learn to properly steer and turn without falling off. It’s a sturdy scooter that is also lightweight but it does not fold up. You can choose from several different colors including blue, red, purple, and orange. This push scooter is slightly more expensive but consider the higher weight limit and the other bonus features that you get with the scooter. Although having a scooter to zoom around on can be a load of fun for a child, there are also lots of great benefits of a scooter that parents will love as well. Riding a kick scooter is an awesome way to help your child learn to balance as well as help him improve his coordination. At first you may notice that your child has trouble powering the scooter with his kicks because his balance is not the best. But with practice and a little bit of help from mom and dad your little one will be balancing with ease. Children need a way to release their energy and need that physical activity to keep their bodies healthy and strong. Riding a scooter is really great exercise as your child will be using their entire body to work to power the scooter and as well as balance. It can be a fun way to work in a physical activity and set a great example for having fun while staying healthy. By incorporating fun exercise into your child’s life now you are setting them up for a life of loving to move and exercise. Remember the last time you were able to successfully master something after practicing and practicing? It’s quite a feeling huh? Just imagine the self-confidence boost your toddler will get when they learn to master riding a scooter just like their older sister or the older boy down the street that they see. Kids want to have fun all the time and what better way to add fun into your child’s day than to let them zoom around in the driveway or the park with their very own scooter. You may just notice that your child wants to go outside and play more often because of his scooter and you may even be able to get him to want to take walks or go places you couldn’t go before if he gets to take his scooter with him. Of course your child won’t get all these wonderful benefits unless you buy the best kick scooter for your toddler. Be sure that if you plan on buying your toddler a kick scooter, you don’t forget a cool helmet to go with it!